CLEMSON, S.C. — In the old days, there used to be a lot of drama in Tiger Town on National Signing Day in February. Clemson students, alums and fans would wait on the edge of their seats to see if a high-profile recruit like C.J. Spiller would sign with the Tigers. 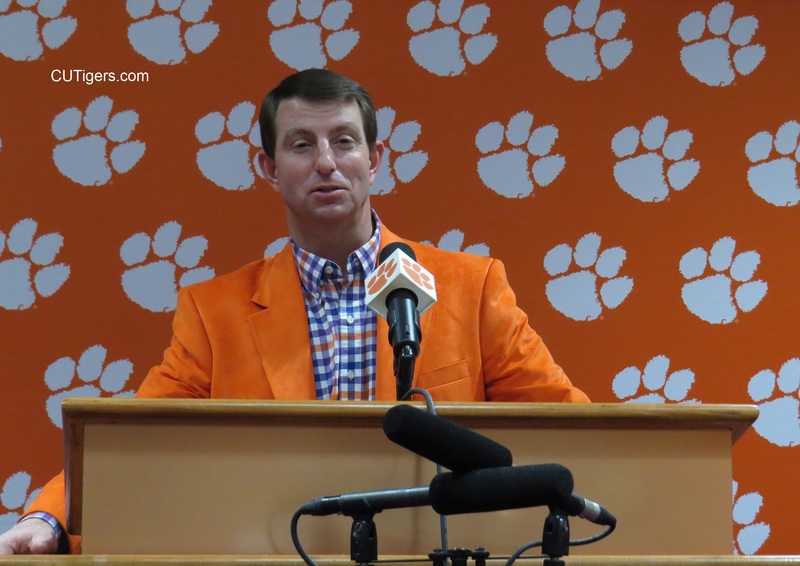 Those days are seemingly long gone, as NSD has become somewhat anti-climactic for Dabo and the Tigers as their success on the field and national brand have grown exponentially in recent years. With an increased trend toward early commitments and now the addition of an Early Signing Day in December, most of the hay is in the barn well before February, and that's just the way Dabo Swinney, Brandon Streeter and company like it. The Tigers signed a school-record 27 scholarship recruits on Early Signing Day in December and added just one more, 3-star RB Michel Dukes from North Charleston, on NSD Wednesday. He had announced his commitment to the Tigers last week. They also extended a gray shirt to OL Mason Trotter from nearby Dorman High School. Like Cade Stewart, who started a couple games on the offensive line last season, Trotter will come in as a walk-on and receive a scholarship at a later date. That was the only real National Signing Day news from a recruiting standpoint for the Tigers. They were in the mix for 5-star RB Jerrion Ealy from Mississippi, but those in the know were expecting him to sign with his home town school, Ole Miss, and the late commitment from Dukes seemed to reinforce that expectation. Even if he had signed with the Tigers, Ealy is projected to be a top-20 pick in this spring's MLB Draft, so it is unclear whether he will even play college football at this time. The Tigers welcomed a couple notable preferred walk-ons to the Clemson Family in twin brothers Jake and Tye Herbstreit, sons of ESPN personality Kirk Herbstreit. Tye is a WR and Jake is a DB. I talked to Kirk about a month ago before the National Championship, and he described the decision process to me, saying that his boys were fully brainwashed Ohio State fans, but after talking to Dabo, they completely bough into his vision and the culture at Clemson. I asked Dabo to talk about their recruitment today, and you can watch his response below. The Tigers have a school-record 17 mid-year enrollees on campus right now, and Dabo is very excited about them. He said he has not been able to spend much time with them yet because of all the travel he's had to do, but the early returns from the staff have been very positive. 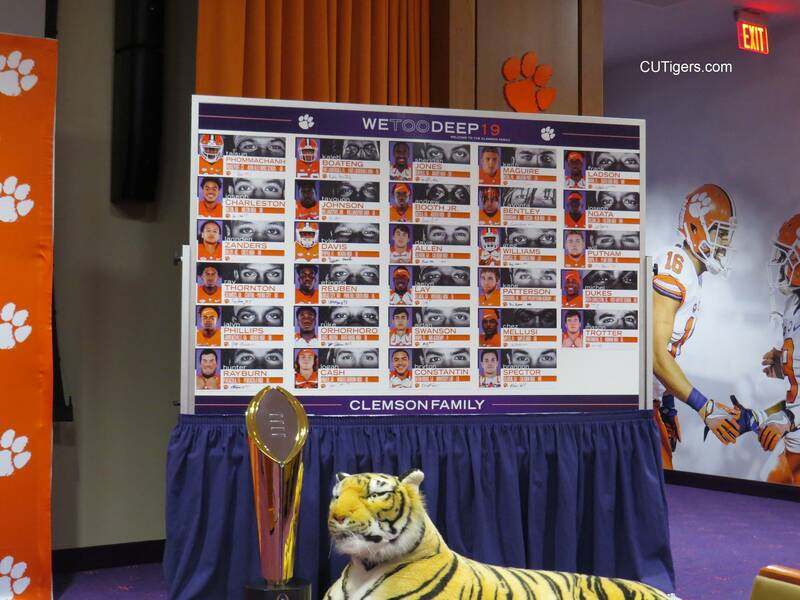 As for the returning players, Dabo had a few notes of interest for us. He said that defensive tackles Nyles Pinckney and Jordan Williams will both miss the entire spring. Pinckney has a slight tear in his pectoral, and Williams had to have a screw put in his leg. Also, DE Logan Cash had a surprise appendectomy, but he should be ready to go for the spring next month. With all the departures on the defensive line and now Pinckney and Williams out for the spring, it will be very interesting to watch the freshmen compete. The only returning player on the interior this spring will be Xavier Kelly, who moved over from end last season and has little experience. Finally, Dabo did not have an update on the NCAA appeal for TE Braden Galloway. He said it is a long process and is still ongoing. Dabo said that they are not expecting Garrett Williams to return next season. He will be with the team this spring but is leaning toward foregoing his final year of eligibility to join the military. So depending on what happens with Galloway, true freshman Jaelyn Lay could be thrown in the fire immediately. Our NSD press conference with Dabo and Recruiting Coordinator Brandon Streeter is below, along with bios for Dukes and Trotter followed by notes on the 2019 class. What a big day for you @jake_herbie02!! Can’t begin to tell you how proud we are of you—Your hard work and dedication has paid off with this incredible opportunity! Couldn’t be more excited for you to join the Clemson program. Good luck and we love you! In High School: Ranked by 247Sports as one of the top 50 running backs in the nation and as the No. 13 player at any position in South Carolina … rated by Rivals.com as the No. 21 player in the state … considered the No. 17 player in South Carolina by ESPN.com … PrepStar All-Atlantic Region selection … concluded prep career with 685 carries for 8,762 rushing yards and 117 rushing touchdowns as well as 34 receptions for 743 yards and nine receiving touchdowns … led his team to an 11-2 record and a state runner-up finish as a senior in 2018 in the school’s first season in AAA … rushed 188 times for 2,030 yards with 29 rushing touchdowns and caught 11 passes for 136 yards with two receiving touchdowns in 2018 … won Lonnie Robinson Memorial Award as SCISA Player of the Year and shared All-Lowcountry Player of the Year honors … notched 335 rushing yards in his penultimate high school game, a win over Porter-Gaud in the SCISA AAA semifinals … helped team to SCISA AA titles in 2016 and 2017 … played his high school football at First Baptist School for coach Johnny Waters … primary Clemson recruiter was Tony Elliott … will enroll at Clemson in the summer of 2019. In High School: Three-year starter who started 41 career games for Dorman … two-time all-area selection by the Herald-Journal, helping his team to back-to-back Region II-AAAAA titles … earned second-team all-state honors from USA Today … guided team to an 11-2 record and a berth in the third round of the SCHSL AAAAA playoffs as a senior in 2018 … credited with a team-high 27 pancake blocks that year in helping his starting running back produce 1,720 yards and 19 touchdowns … as a junior in 2017, recorded 28 pancake blocks and led an offensive line that helped produce three 1,000-yard rushers en route to a state championship berth … ranked among the top 75 recruits in South Carolina according to 247Sports … participated in the Shrine Bowl … played for coach David Gutshall at Dorman … high school teammate of Clemson quarterback Ben Batson and offensive lineman Jordan McFadden … primary Clemson recruiters were Robbie Caldwell and Jeff Scott … plans to enroll at Clemson in the summer of 2019 with intent to grayshirt. As of 6 p.m. ET, Clemson’s recruiting class ranks ninth according to Rivals, ninth according to 247Sports and 10th according to ESPN. Clemson has now ranked in the Top 10 in ESPN”s recruiting rankings each of the last five years, in the Top 10 in Rivals’ recruiting rankings in four of the last five years and in 247Sports’ Top 10 each of the last two years. Clemson has now recorded consensus Top 10 recruiting classes with those three services in back-to-back years for the first time. Clemson’s class ranked fifth, fifth and eighth on according to ESPN, 247Sports and Rivals, respectively, a year ago. Clemson’s recruiting ranking led all ACC programs, according to those three recruiting services. Thirteen members of Clemson’s signing class rank among Rivals’ Top 250, led by cornerback Andrew Booth at No. 14. The 13 signings from the Rivals 250 are Clemson’s most since 2016. Clemson signed 12 of the ESPN 300. It marks the second straight year in which Clemson has collected 12 commitments from the ESPN 300. Nine of Clemson’s signees appear in the 247Sports’ Top247. Clemson’s 29 signees announced represent 14 states, the most for a Clemson signing class since 1989, Danny Ford’s last class. That ties for the most different states in a class on record. The previous high for Clemson under Head Coach Dabo Swinney was 10 different states represented in the classes of 2016 and 2017. Swinney has now signed student-athletes from 24 states in his Clemson career as a head coach. This year, he signed players from California, Michigan, Connecticut and Pennsylvania for the first time. Since 1972, Clemson has signed student-athletes to football scholarships from 34 states and the District of Columbia. Clemson signed two players rated as the No. 1 player in their respective states, including Connecticut quarterback Taisun Phommachanh (top-ranked in his state by Rivals and ESPN) and Pennsylvania linebacker Keith Maguire (top-ranked by Rivals). This signing class includes seven from the state of Florida, the most representatives from the Sunshine State since 2008 when a school-record nine Floridians came to Clemson. The 2008 and 2019 classes mark the only times Clemson has signed at least seven student-athletes from Florida. Clemson signed eight from the state of Georgia, the most from that state since 1998 when Tommy West’s last class featured nine players from Georgia. The record for signees from Georgia in a single class is 11 in 1985. Wide receiver Joseph Ngata (Folsom, Calif.) was first signee from the state of California to come to Clemson since 1991 when Bobby Forbes signed with the Tigers. In 1995, Dave Coggin signed with Clemson from Covina, Calif., but he never came to school, instead opting to sign with the Philadelphia Phillies, for whom he played three years. Coggin’s father was a 1965 Clemson graduate. Linebacker Keith McGuire (Media, Pa.) was the first student-athlete from Pennsylvania to sign with Clemson since 1995 when current Clemson quarterbacks coach and recruiting coordinator Brandon Streeter signed with the Tigers out of Gettysburg. Quarterback Taisun Phommachanh was the first resident of Connecticut to sign with the Tigers since 1996 when Jason Martinelli and Idris Price signed with West and the Clemson program. Current Clemson All-American Christian Wilkins played his high school football in Connecticut at Suffield, Conn., but lived in Springfield, Mass. After not previously signing anyone from Louisiana in 13 years, Clemson has now had a signee from that state in two of the last three years (Travis Etienne in the Class of 2017, Bryton Constantin in the Class of 2019). Defensive lineman Ruke Orhorhoro was the first Clemson signee to play his high school football in Michigan since 1975 (Joe Carolan).